Gingivitis is inflammation of the gums usually caused by excessive plaque on the tooth. 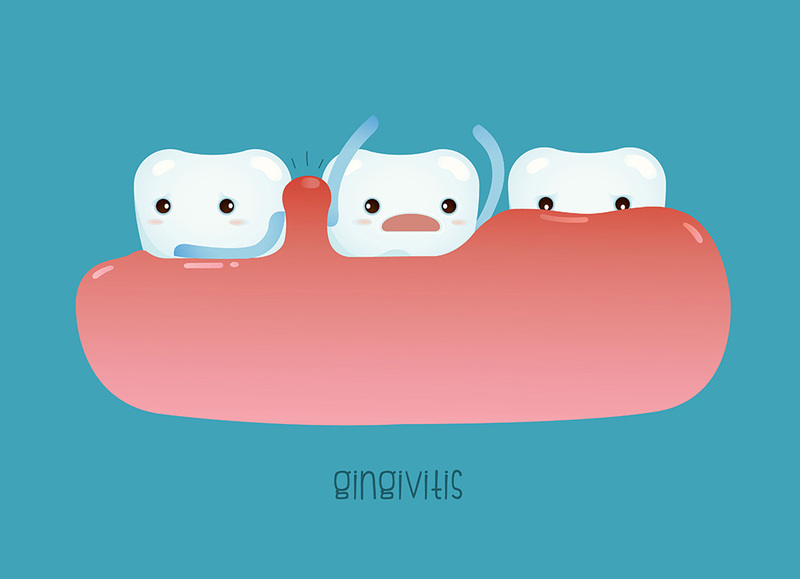 With proper oral care (brushing, flossing, and/or mouthwash) mild gingivitis can be reversed. If not taken care of, gum inflammation can progress to tissue destruction, bone breakdown, and eventually tooth loss. In addition to plaque and poor oral hygiene, gingivitis can also be caused by smoking, other pre-existing oral problems, stress factors, or genetic history. Gingivitis is the body’s response to bacteria from plaque in gaps between teeth, gum grooves, and places plaque tends to build up such as along tartar or denture lines. As with most inflammation, gingivitis causes swelling, red or purple coloration, tenderness or pain in the gums. Additionally, bad breathe or bleeding teeth or gums after brushing or flossing could be a sign that gingivitis is present. Gingivitis is diagnosed when bleeding or swelling is present or plaque levels are high in the oral cavity. Dentists may also use x-rays or periodontal probing to look for signs of periodontitis. The primary treatment is to remove plaque and thus the bacteria instigating the response in gums. This may take several dental cleanings as well as at-home oral care. Dentists will often recommend powered toothbrushes to better battle the plaque, as well as soft picks for areas between teeth, braces, or permanently placed retainers. If the gingivitis is in further stages, scaling, root planning, or tissue removal may be employed. Dentist might also recommend mouth wash containing antibiotics. Texans want to find the best fort worth dentist to care for their family’s smiles. So if you are looking for the best dentist near you, H. Peter Ku, D.D.S., PA’s practice is the right choice!